Light and crispy wafer leaves covered with the finest chocolate: what a delight! Incredibly rich in chocolate (82% of the product) and so irresistible . Presenting: Fogliette 100g! After Tortina 125g and Patisserie 100g, the third line of products that completes Loacker Gran Pasticceria. Perfectly in line with the expectations of chocolate lovers searching for light crispiness, Fogliette has been created with Loacker family passion, only using the very best ingredients to guarantee the highest quality and perfect products. Sarntaler Mountain Salami L. Moser - approx. 290 gr. Our mountain salami consists of controlled, thin and tender pork which is enriched with natural spices and is dried in rough height air. Salami Hot Sausage Napoli Levoni ca. 350 gr. Salami the area of Mount Vesuvius with a large-grained mix. As per tradition, it is filled in natural casings and then lightly and naturally smoked. Area: Campania, Characteristics: Decidedly spicy version with lots of chilli pepper and paprika. Gran Pasticceria Tortina Mini Original 144 gr. - Loacker 6,45 EUR / 4,48 €/100 gr. Chocolate Wafer Gardena Chocolate 38 gr. 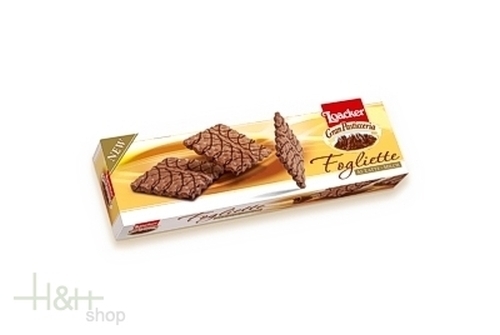 - Loacker 1,15 EUR / 3,03 €/100 gr. Gran Pasticceria Patisserie Creme Noisette 100 gr. - Loacker 3,35 EUR / 3,35 €/100 gr. Gran Pasticceria Patisserie Dark Hazelnut 100 gr. - Loacker 3,35 EUR / 3,35 €/100 gr. Chocolate White 87 gr. - Loacker 2,25 EUR / 2,59 €/100 gr. Gran Pasticceria Tortina Original 21 gr. - Loacker 1,50 EUR / 7,14 €/100 gr. Gran Pasticceria Patisserie Noir Orange 100 gr. - Loacker 3,35 EUR / 3,35 €/100 gr. Chocolate Milk 87 gr. - Loacker 2,25 EUR / 2,59 €/100 gr. Gran Pasticceria Patisserie Coconut 100 gr. - Loacker 3,35 EUR / 3,35 €/100 gr. Chocolate Wafer Classic Chocolat Napolitaner 118 gr. - Loacker 2,45 EUR / 2,08 €/100 gr. Gran Pasticceria Tortina Dark Noir 125 gr. - Loacker 4,70 EUR / 3,76 €/100 gr. Chocolate Wafer Classic Chocolat Dark Noir 118 gr. - Loacker 2,45 EUR / 2,08 €/100 gr. Gran Pasticceria Tortina Original 125 gr. - Loacker 4,70 EUR / 3,76 €/100 gr. Dark chocolate with blueberry cream 53 % cocoa 100 gr. - Pichler Chocolates Osttirol 4,60 EUR / 4,60 €/100 gr. Milk chocolate with milk cream 35 % cocoa 100 gr. - Pichler Chocolates Osttirol 4,60 EUR / 4,60 €/100 gr.